Alternative wedding ceremony ideas – If you’re planning your wedding and feel like you want a little extra something special to add to the proceedings of the day then you will be happy to know that there are a lot of great, sentimental, and quirky traditions out there to choose from. The kinds of traditions are special in that they really do set your wedding apart because these are the kinds of details that guests remember and think back on fondly. A Unity Sand Ceremony is a simple ceremony in which the bride and groom pour coloured sand from two separate containers into a Unity Vase. This symbolizes the joining of two beings into one family. 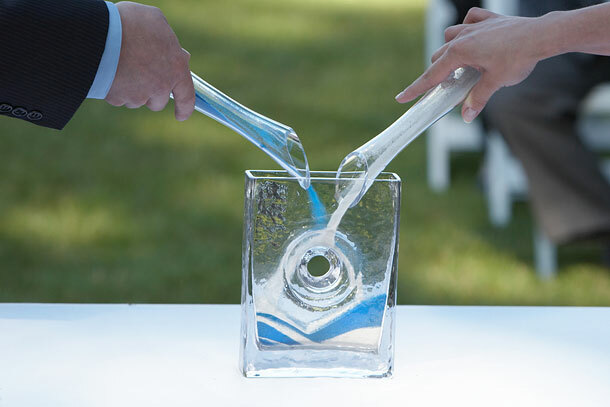 The best way to do this is to use sand that matches the colours of your wedding, and then alternate pouring two different colours until the Unity Vase is full. This can then be kept as a reminder of your unity, so when choosing your Unity Vase keep in mind that it may be best to choose something that you can close afterwards. In a Rose Ceremony the bride and groom exchange red roses after exchanging rings. These roses represent the sentiments and emotions that go with marriage. In the future, a single red rose can be given to your spouse to remind them of those sentiments. During a Stone Ceremony all the guests are given a small stone or pebble when they arrive. Later during the ceremony they will be asked asked to hold these pebbles in their hands and make a wish for the bridal couple. Afterwards the stones are collected and kept as a memento of the wedding and the good wishes that were made for the couple. You may even provide permanent markers and ask your guests to write a word which represents their wish for you on their stone. A Remembrance Ceremony is simply where the bride and groom light a candle of Remembrance in honour of any loved ones who have passed on, usually a parent or beloved grandparent.